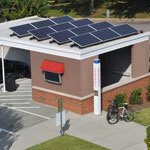 NC State has a long history of solar installations on campus. Additionally, the university has been a leader in solar research since the earliest days of the technology. The Solar House was first opened to the public in 1981, and the NC Clean Energy Technology Center at NC State has a focus on solar energy. 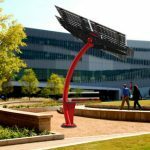 The university has researched several potential solar energy sites on campus for organizations interested in partnering or donating toward a future solar installation. Contact sustainability@ncsu.edu. 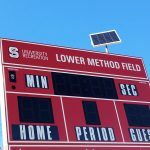 Two Solar Scoreboards November 2017 160 watts This project was funded through the Sustainability Fund. Energy is consumed on site to power two scoreboards. 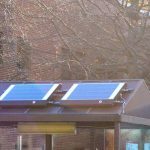 Solar Charging Station at Bus Stop February 2017 160 watts This project was funded through the Sustainability Fund. Energy is consumed on site for power electronics charging using direct current (DC). 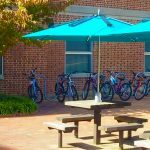 Solar Umbrellas Varies 162 watts Three 9-foot umbrellas (with 54 watts capacity each) located between Tucker and Owen Residence Halls feature solar panels powering lithium ion battery hubs, which each offer three USB ports for charging mobile devices as fast as a wall outlet. More umbrellas have been added on campus, including at Bragaw Residence Hall, Park Shops and Carmichael Recreation Center. Centennial Campus Solar Structure October 2015 1.5 kW Conceptualized and installed by the Park Scholarships Class of 2015. Solar House Annex More than 20 years of ongoing solar and wind testing Solar Total: 6 kW. 1 kW Kanika I, 2 kW Kanika II, 1 kW Blue Sun, 2 kWSunPowerWind Total: 2.2 kW. 1.2 kW Wind Spire, 1.0 kW Sky Stream The small systems were donated for testing. The current systems feed back to the Duke Energy power grid. RECs are being accumulated. Solar Pavilion in Welch, Gold, Syme courtyard July 2012 3 solar panels, 0.7 kW Joint student and faculty project installed from the 2010 Think Outside the Brick competition winners. 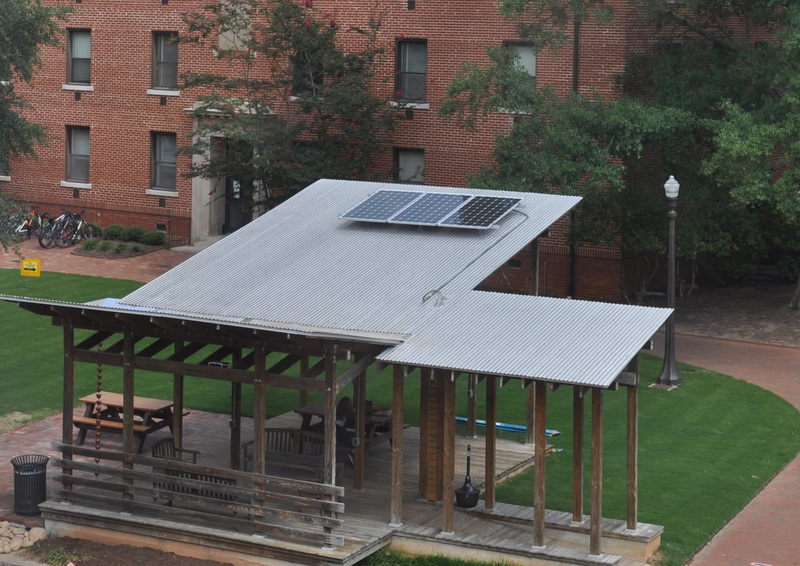 Provides electricity to two outlets under pavilion for students working outdoors. Partner I Rooftop 2015 22 kW The 96 solar panels were donated by Strata Solar. Centennial Campus Development Office covered the cost to install the panels. The solar PV panels are wired to the main electrical panel in the building and are planned to power a future DC circuit. RECs accrue to the university. James B. Hunt Jr Library 2012 12 solar thermal panels James B. 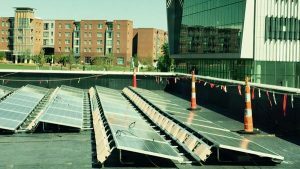 Hunt Library hosts a 12-panel solar thermal array that pre-heats domestic hot water before steam heat is utilized. Sullivan Shops III – Solar Thermal 2011 8 solar thermal collectors Project was a part of new building construction which houses Waste Reduction & Recycling and Grounds Management. The collectors use a closed loop system to deliver hot water to VAV boxes for the building’s HVAC system. Carmichael Gym – Solar Thermal 2011 30 Solar Thermal Collectors and 112 Solar Thermal Collectors Financed as part of the 13-building performance contract, 30 panels are in a closed loop system to heat domestic hot water and 112 panels provide reheating for the swimming pools (circulating about 70 gallons per minute). The system is projected to generate approximately $11,500 in annual utility cost savings. RECs are being accumulated. Keystone Science Center – PV 2010 40 kW A donation to building occupant FREEDM Systems Center, electricity is fed back into the building. Research IV – PV 2009 3 kW Solar modules were donated by Hamlin. Advanced Energy is located in the building and its partners donated the wires and inverter. Electricity is fed back into the building. Carter-Finley – PV 2008 75.6 kW Owned by Carolina Solar, the array was the largest in the state at the time of installation. Electricity is fed back to the Duke Energy grid. Park Alumni Center 2006 1 solar thermal collector Installed as part of the Park Alumni Center building project, the solar thermal installation preheats cold city water for hot water needs in the building. RECs are being accumulated. 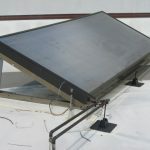 Solar House – PV and Solar Thermal 1981 3.0 kW Garage, 5.4 kW PV Roof 2 Solar Thermal Collectors The Solar House was opened in 1981 with 2 solar thermal collectors on the roof. Since, a 5.4 kW PV system has been added in addition to a 3 kW system on the garage. This website, which represents sustainability efforts across the university, is managed by the University Sustainability Office. Contact us at sustainability@ncsu.edu.